I had an interesting conversation with a young Jamaican woman I know recently. She is currently visiting the island from Canada with her eight-year-old son. It was instructive, she said, to view Jamaica through her young son’s eyes. He expressed his thoughts on arriving in Kingston with a refreshing bluntness, as children often do. While an adult visitor to Jamaica might diplomatically overlook parts of the ride from the airport that are less than pleasing to the eye, this young man had no such qualms. Boys of that age are very energetic, and my friend tells me he soon became impatient and frustrated at having to stay behind burglar bars for most of the day. She took him to Hope Zoo and on other excursions, but he wanted to know why he just couldn’t go out and play, ride his bicycle and run around outside as he did at home, freely. When he wanted to go to the nearby supermarket he asked, “Why can’t I just walk there?” instead of having to go there in the car. 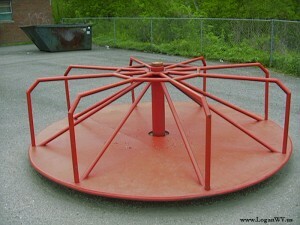 As a child, I used to fly around on a contraption like this – until I felt nauseous. The boy concluded that Kingston is “not kid-friendly.” There are very few open spaces for children to run and play; no playgrounds at all. 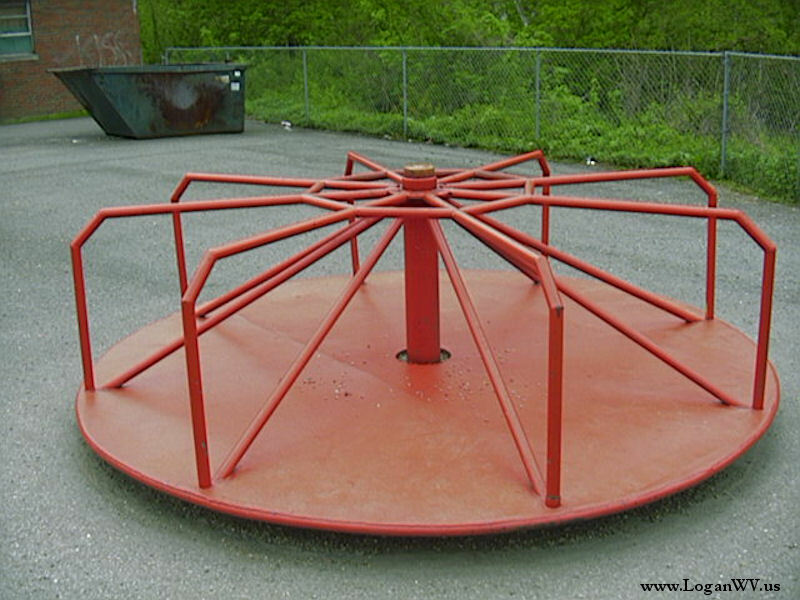 (My own memories of playgrounds growing up in London are rather mixed; I used to make myself sick with dizziness, spinning around on the merry go round. The rough boys on the swings used to frighten me). Yes, cities are harsh places to live sometimes – for adults as well as children. Some of us are able to surround ourselves with green: a patch of lawn, a few of the obligatory but rather dull palm trees. We planted two lignum vitae trees in our yard, to replace the many that have been chopped down in recent years to make way for townhouse developments in our area. After all, the lignum vitae is Jamaica’s National Flower. But we are fortunate to have the space. In Kingston’s inner city neighborhoods, there’s an ackee tree here and there, potted plants on porches and doorsteps, but not much else. No gardens, no parks or public spaces to relax, enjoy a quiet evening or a warm, sunny morning. 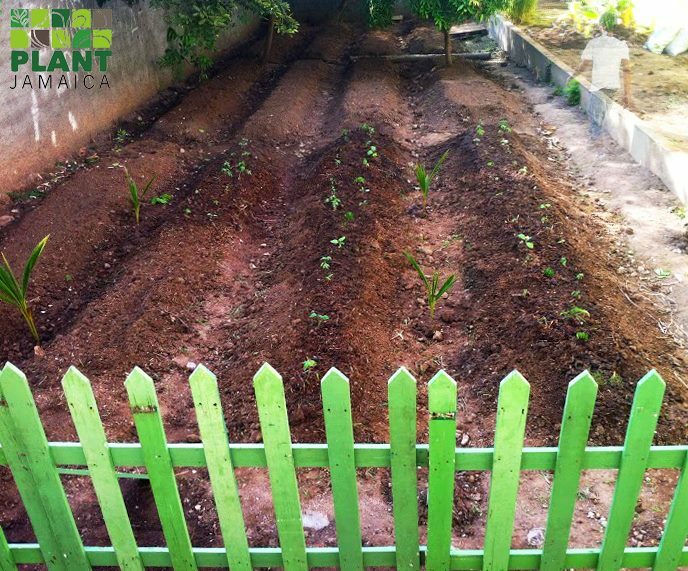 Plant Jamaica – a non-governmental organization that works alongside Paint Jamaica – is a step in the right direction, but needs to happen on a much larger scale. Both need a great deal more support, although they have done quite a lot of their fund-raising online. You can find them both on Facebook, by the way. Research has concluded that green spaces in cities are somehow good for the soul – for our mental health as well as physical, reducing aggression and stress. The UK’s Centre for Confidence and Well-Being cites a number of studies that point to this. When I am overseas, I watch the happy urbanites: feeding ducks in the pond, flying kites, walking their dogs, jogging, doing Tai Chi, playing frisbee, lazing around, reading a book, romancing… And I think they do not know how lucky they are – to have this space in the middle of a city. Just a space to do what they like in. A place for children and dogs and old people and mothers and teenagers to sit quietly, or let off steam. Of course there are environmental benefits. Trees are a natural filter for the dust and pollution that we humans produce. More green helps reduce temperatures (remember that long, hot and very dry summer we endured last year?) and protects water quality. It all makes sense, doesn’t it? Especially with climate change upon us. The only two reasonably large spaces where the exhausted and harried residents of Kingston can recreate are Emancipation Park (tightly guarded, run by a private company) and the Hope Botanical Gardens. Both are heavily used – you should see the crowd at Emancipation Park on Friday evenings – but Hope Gardens has now started charging a parking fee to help pay for its upkeep. The entrance fee for the adjoining Hope Zoo is beyond the reach of the average Jamaican, sadly. National Heroes Park hardly qualifies. It is a huge piece of worn and weary wasteland. Part of it has become a parking lot for the nearby Ministry of Finance, and there is another manicured and pretty section (guarded) for the National Heroes monuments. 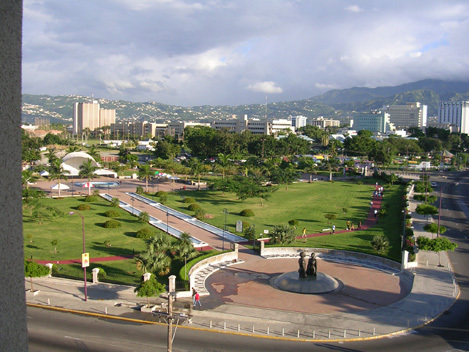 The St. William Grant Park in downtown Kingston is constantly under siege from men urinating against the walls and homeless people sleeping there. Mandela Park should never have been named after the great man – it is a travesty, consisting mainly of dirty concrete. Of course, it takes a considerable amount of cash to construct a playground, or to plant out a park with all the amenities. 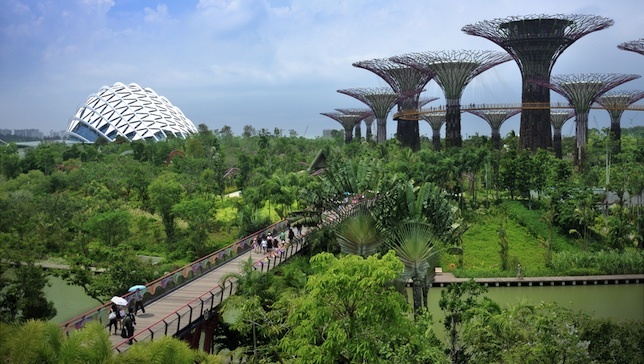 And, a bit like art galleries and museums and all the things that make our lives more interesting and enjoyable, “greening” our urban areas is something left way at the bottom of the list of priorities for government ministries. If it is on their radar at all. If some benefactor or private sector body wants to create a park, then great – go ahead and do it, they will say. But there is no focused, concerted effort; perhaps because our urban areas are hardly “planned” in the first place and building regulations are broken quite recklessly. There are other issues: security, for one, besides the apparent lack of civic pride among our people (we need to work on both of these not insurmountable obstacles). We could start small, as Plant Jamaica and Paint Jamaica are doing. There are many so many spaces across our cities and towns that, with a little loving care, could blossom and flourish. Why don’t you try it on your street corner? Singapore is densely populated but still has a great deal of green space. It is also developing a number of urban farms (“agritourism”) with walkways linking them. Sad fact is the over urbanization of Jamaica (aka urban sprawl). A major demarcation between urban centers and residential in the past was the difference in visible vegetation (many trees grandfathered in after agri to residential conversion). Sadly today there is very little visual difference. Gone are the days of swaying fruit trees – coconut trees now occasionally replaced with immature imported palms, a weak attempt to imitate a “tropical vista” with no economic value to citizens. Majestic trees along Hope Rd – Liguanea, Constant Spring, Tom Rectam Drive, Spanish Town, Ochi, ….. have expired or been removed, replaced with a constant stream of autos (read: pollution) along our roadways. Cause: Ineffective Govt planning & lack of Corporate concern in this area. Who wrote this blog. I want to weep with the knowledge that someone else shares my pain over how Kingston was ‘developed’. Thanks for taking the time to write this. I love this city but I long for well-planned, public open spaces and consideration for pedestrians. I have never heard anything from KSAC remotely sensitive to this issue. That’s what emancipation part gave Kingston but we need so many other smaller spaces. Each community should have such a space. I absolutely agree. It’s nice to have a reasonably big “fancy” park but I did try to convey that it is at community level that it is important. A space for the children to play when they get home from school, somewhere for people to sit and chat under a tree… And one that is well kept and maintained by local people. Dear Kimberly: Thanks! Yes, I do share your pain. This seems to be the last thing on everyone’s list (especially the KSAC it seems) – they don’t have the time, resources or interest, it seems. We will probably have to create our own small spaces ourselves! I love Kingston, too. It deserves better… A little vision and as you say, a lot more sensitivity. Thanks for your comment…Best wishes, Emma Lewis (the author of this blog). Thank you so much! I really hope that you will have the resources to continue moving forward with your beautiful work. I am sure it lifts up the hearts of the residents – especially, perhaps, the children. All the best!